Domed Shaped Head? 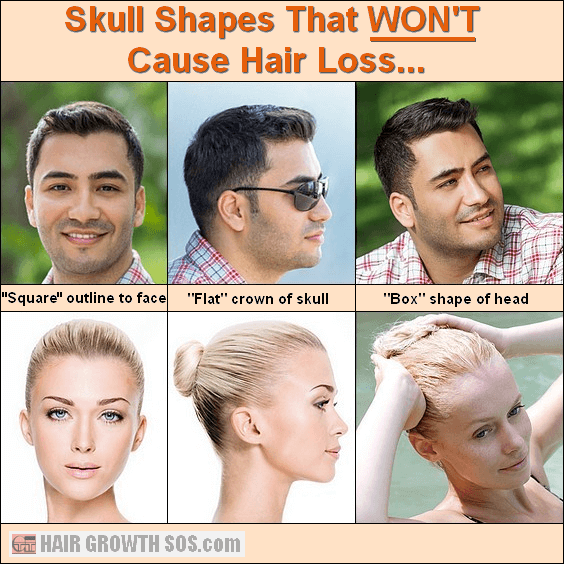 Your Skull Shape Is What Causes Hair Loss! What Causes Hair Loss? Skull Bone Growth! Hair loss will eventually affect nearly all men and up to half of all women at some point in their lives. This page explains how skull expansion (skull bone growth) is what causes hair loss to develop in so many people. It also reveals two basic head shapes – one that will develop skull expansion and hair loss, and one that won’t. Both the shape and size of your head is, quite obviously, determined by the bones of your skull. And, as you’re about to find out, some skull shapes will lead to hair loss, while others won’t. Take a look at the photos below. You can see that all these men have gone bald following severe hair loss from androgenetic alopecia. And you can also see that they share a very similar skull shape. They all seem to have a very round skull, giving a rather domed shape to the head, especially when viewed from the front or back. That curvature is what causes hair loss of this type. If you now take a look at the photos below, you can see that these people appear to have suffered no hair loss whatsoever. That's because all these men and women have a very flat broad forehead and flat crown to the skull. And this gives a distinctive "square" outline to the face, and "box" shape to the head, as you can see. These features are nearly always present in people who manage to maintain a full head of hair for life. So, whether or not you develop skull expansion and hair loss all depends on the shape your skull. However, this is only a very brief look at skull shape - there’s a lot more to it than just "square" and "round". Further details are given on the following pages. 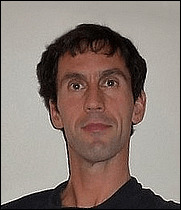 "Dear Paul, I just wanted to tell you that I was skeptical about your theory but I felt the urge to tell you, you're completely right. I started observing people and not only I noticed that they grow hair in the flat area of their head and lose hair in the round area of their head, but if you look at the shape of their head (how it has grown through the hair) you can't even imagine hair growing in the very round zone. It's so clear now and there's no exception. Where the head is flat, hair grows. Where the head is round, hair doesn't grow. 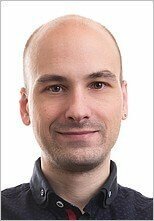 I even noticed on completely bald people that you can see the lines of their extra bone growth pretty easily as if their face remained the same while the head kept growing in size." It’s quite easy to see how skull expansion causes hair loss if you take a close look at the blood supply to the scalp. 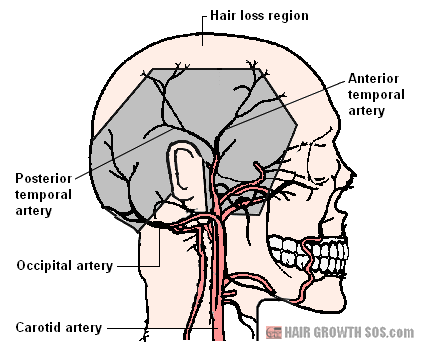 The picture below shows just the main arterial network of the scalp. These arteries then branch out into smaller arterioles and finally capillaries (not shown in the picture). And this capillary network then provides hair follicles with the blood, and therein, nutrients it needs to grow hair. The blood pressure and flow rate within large blood vessels will obviously be much greater than it is within tiny capillaries. And, as you can see, these larger blood vessels are a lot closer to hair follicles on the sides of the head than they are to hair follicles higher up on the crown. So this means that blood pressure and flow rate within capillaries on the sides of the head will be slightly higher than it is within capillaries on the crown of the head. Hair growth is very rapid – faster than any other part of the body except bone marrow. And there’s also a greater density of hair on the scalp than anywhere else on the body. So, clearly scalp hair needs a regular supply of nutrients if it is to grow well. In this diagram you can see that only a single capillary serves each hair root. And because each capillary is just one cell wide, blood can only supply each hair root one blood cell at a time. So, from this low blood flow rate through each capillary, together with the relatively high demand for nutrients by hair follicles, you can appreciate how scalp hair growth could easily begin to suffer should there be any interruption in the blood supply. Skull expansion will cause the surface area of certain skull bones to increase. This will progressively stretch and pull tight the scalp tissue which overlies the skull. And this increase in scalp tension can also quite often make the scalp feel very itchy and tight. This disrupts the microvascular blood supply (i.e., the capillary network) to the hair follicles. Blood flow is reduced and so the supply of nutrients to the hair follicles decreases. In time, this causes hair follicle miniaturization. Thinner, weaker hair growth then follows and hair loss develops. "There is a relative microvascular insufficiency to regions of the scalp that lose hair in male pattern baldness." 2. The skull expansion process might also erode brown adipose tissue (brown fat) within the dermis of the skin. This brown fat promotes angiogenesis (new blood vessel formation) – something that’s vital in each new hair growth cycle if a follicle is to successfully grow hair. So, clearly, if there’s a reduction in brown fat, this could also contribute to hair loss. So, that’s a very basic look at how skull expansion causes hair loss. On the next page, I’ll explain how the infamous male pattern baldness profile develops. This is page 2 of 6. Read next page? 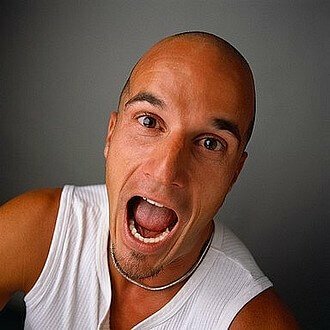 Why the "pattern" in male pattern baldness develops. Read previous page? Male pattern baldness genetics explained.